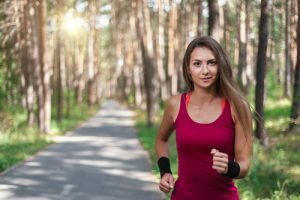 Many athletes, runners, and fitness enthusiasts approach breast augmentation with careful consideration. Common concerns are the effects of breast augmentation on athletic performance, breast implants showing through the skin, the durability of breast implants, and discomfort during strenuous activity due to the weight or width of the implants. With every patient, Dr. Batra evaluates their unique goals, concerns, and lifestyle habits so that the end result accommodates their every need. Breast implants are very durable devices and can withstand hundreds of pounds of force. Implant ruptures rarely occur, and the low chance of rupture does not increase with the activity level of the patient. If rupture does occur, it can be easily corrected with a breast revision. Patients who have thin skin, minimal existing breast tissue, or prominent chest muscles are more likely to experience implant rippling or wrinkling. Depending on the patient’s body and desired breast size, Dr. Batra can customize the procedure by placing the implant either above, below, or partially below the pectoral muscle so that this risk decreases and the final result appears natural. Patients should note that the overall risk for implant rippling is low, especially with the use of silicone gel implants. Breast implants will add weight and girth to the chest, which can potentially impact a golfer’s swing, a boxer’s punch, or a runner’s arm motion. While the breasts may initially feel different during athletic activity, patients typically get used to their new breasts a couple of weeks into their regular routine. If there is any impact on athletic performance, it is minimal. Should that be the case, most patients will gladly adapt their muscle memory to gain the confidence that comes with larger, more feminine breasts. If you are interested in a breast augmentation procedure, please schedule your consultation by calling (858)365-3558 or fill out our online contact form for more information.